The Apple Watch may be able to accurately detect hypertension and sleep apnea, according to a new study published today by the University of California San Francisco (UCSF) and Cardiogram, a company that's developed an app that breaks down heart rate data collected by the Apple Watch. Using data collected from 6,115 Apple Watch owners and interpreted by Cardiogram's deep neural network "DeepHeart," the study found that the neural network was able to recognize hypertension (aka high blood pressure) with 82 percent accuracy and sleep apnea with 90 percent accuracy. Based on previously-established principles suggesting people with low heart rate variability are 1.44x more likely to develop hypertension and that algorithms can accurately determine sleep apnea by beat-to-beat rate variability, Cardiogram and UCSF researchers recruited people for a Health eHeart study and then trained the DeepHeart neural network to detect new variables. Cardiogram co-founder Brandon Ballinger told TechCrunch the DeepHeart neural network was trained using data from 70 percent of participants, and then tested on the remaining 30 percent who were not used for training purposes. Of the 6,115 people who participated in the study, sleep apnea was detected in 1,016 participants and hypertension in 2,230. 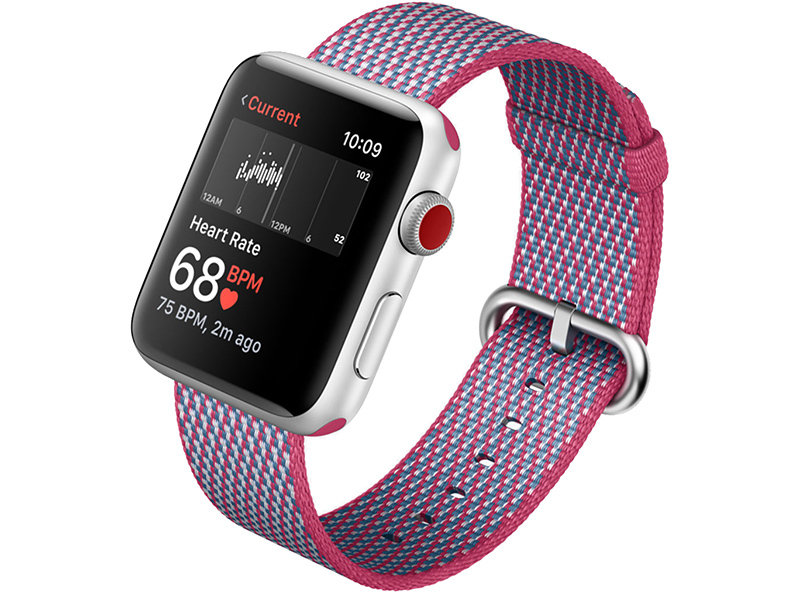 The study results are promising enough that Cardiogram believes with additional research, wearables like the Apple Watch could be used as a cost effective way to test for hypertension and sleep apnea. The result was accuracy high enough to support feasible, cost-effective, widely-deployable screening of hypertension and sleep apnea. For sleep apnea, DeepHeart achieved an accuracy (c-statistic, or AUC ROC) of 90%, with several attractive operating points. For example, we can detect 52% of sleep apnea ( compared to 20% today) with a specificity of 97%. If a specificity of 82% is acceptable, then we can detect even more sleep apnea, about 75% of people. For hypertension, the AUC was 0.82, with an example operating point of 81% sensitivity at 63.2% specificity. Cardiogram says that peer-reviewed clinical research will be necessary to further determine whether wearables are able to screen for major health conditions like sleep apnea and hypertension, but the research results will be translated into future Cardiogram features. Cardiogram previously used the same neural network and Apple Watch data to determine that the Apple Watch is able to detect abnormal heart rate rhythms with 97 percent accuracy. This has led Apple team up with Stanford for its own study on whether the Apple Watch can detect abnormal health rhythms and common heart problems. In the future, Cardiogram plans to expand its research to additional conditions like pre-diabetes and diabetes. I used to think that too, but I've recently started wearing my watch to bed to monitor my sleep with the app Sleep Watch. Turns out getting the battery to last for me throughout the day and night was just a matter of changing my charging habits. Now I charge the watch after I get up while I'm getting ready. Usually charges enough to make it through the day and the next night... and that's with a Series 0. Speak for yourself. The Series 3 42mm lasts about 2.5 days for me and fully charges in 45 min. It gets a full days charge from about 15-20 min. I charged it last night while taking a shower. Wore it to bed for use as my alarm and wore it all day without charging it again at work using it (email, messages, Things, the time) and it’s at 67%. If I were to throw it on the charger it would be fullly charged in 10-15 min. That’s about the length of my shower and getting dressed. If I sleep with it on I lose about 4% overnight (turning theatre mode on helps). The battery life issue has definitely been solved. Series 3 has phenomenal battery life. I can go for multiple days before I have to charge. I sleep with mine every night. I charge it for about 1.5 hours each morning before work. Horsepucky. My S0 is 2 1/2 years old, and EVERY night it is on my wrist. I’m deaf, so it’s my alarm clock. In the morning I get up, put it on the charger (typically 40-60% charged) have my morning tea, and by the time I’ve had my shower it’s ready for the next 24 hours. True... however it’s really easy to charge 30 mins at morning and night while getting ready for bed/morning. That’s what I’ve been doing for nearly 2 years. 60 minutes of charging (split between morning and night) has been enough for me most of the time, because the watch charges so quickly. Doing this actually increases the longevity of the watch by keeping it between 40-80% (typically about where mine stays), rather than allowing it to drain low and then sit on the charger all night long. Obviously depending on your schedule you might have to adjust, but I haven’t had any issues. If you enable Theater Mode you get even more time since the display won't come on every time you move around in bed. If you also put it in AirPlane Mode since it's unlikely that you'll need to get notifications whilst sleeping you can further reduce the power usage. I think it only registers like 1–3% over 6 hours with those two enabled. I also only charge while showering and getting ready, which is more than enough time to keep it charged for more than a day (although I do tend to shower twice a day). I've even been able to get several days out of my Series 0 on a very long camping trip over a mountain where there was no cell signal by doing those steps, but that had no altimeter or GPS, so I'm not sure how that would work with my Series 3. This true with S0, but the others this is not true. I charge mine for about an hour before bed and sleep with it every night.